"A gut punch of a book in the style of Le Guin, Atwood, and Butler. Claire G. Coleman's debut novel blazes with truth." "Jacky was running. There was no thought in his head, only an intense drive to run. There was no sense he was getting anywhere, no plan, no destination, no future. All he had was a sense of what was behind, what he was running from. Jacky was running." The Natives of the Colony are restless. The Settlers are eager to bring peace to their new home, and they have a plan for how to achieve it. They will tear Native families apart and provide re-education to those who do not understand why they should submit to their betters. Peace and prosperity are worth any price, but who will pay it? This rich land, Australia, will provide for all if only the Natives can learn their place. Jacky has escaped the Home where the Settlers sent him, but where will he go? The Head of the Department for the Protection of Natives, known to Settlers and Natives alike as the Devil, is chasing Jacky. And when the Devil catches him, Sister Bagra, who knows her duty to the ungodly, will be waiting for Jacky back at Home. An incendiary, timely, and fantastical debut from an essential Australian Aboriginal writer, Claire G. Coleman. Do you recognize this story? Look again. This is not Australia as we know it. This is not the Australia of our history books. 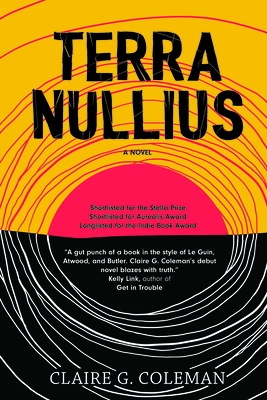 This Terra Nullius -- shortlisted for the 2018 Stella Prize and Highly Commended for the Victorian Premiers Literary Awards -- is something new, but all too familiar. Claire G. Coleman is a writer from Western Australia. She identifies with the South Coast Noongar people. Her family are associated with the area around Ravensthorpe and Hopetoun. Claire grew up in a Forestry's settlement in the middle of a tree plantation, where her dad worked, not far out of Perth. She wrote her Stella Prize finalist black&write! fellowship-winning debut novel Terra Nullius while travelling around Australia in a caravan.